Lots of brands would love to have Wikipedia articles. If you’re reading this, I’m going to assume you already know why having one can be beneficial for yours. In this article I’m going to cover how a brand qualifies to have an article, and how to go about getting one if in fact your brand does qualify. In a nutshell, your brand is presumed to qualify for a Wikipedia article, if it has received significant coverage in multiple, independent, reliable sources. other works in which the brand talks about itself—whether published by the brand, or re-printed by other people. Trivial or incidental coverage in a source is not sufficient: It isn’t enough to just be mentioned a couple times. The coverage must provide information that can be used to add depth to a brand’s Wikipedia article. 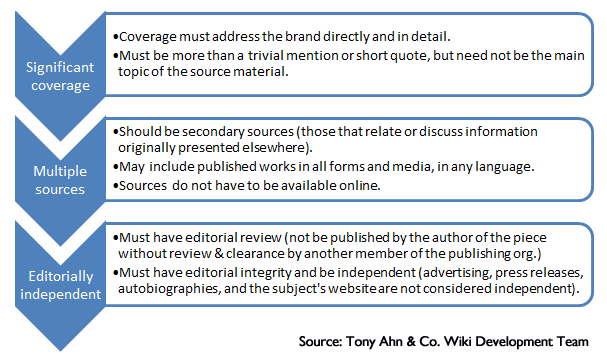 If the depth of coverage in a particular source is not substantial, then you must cite multiple sources. Trivial or incidental coverage of a subject is not sufficient to establish notability. passing mention, such as identifying a quoted person as working for an organization. If there are multiple sources about your brand that carry more than incidental coverage, congratulations! Your brand may qualify for an article. Unfortunately, being eligible for an article does not make it magically appear; somebody has to write it. There are several options for making that happen: You can ask a member of the Wikipedia community to write it for you, you can hire a service to write it for you, or you can write it yourself. There are also other options that I recommend against, which I’ll identify later on. Wikipedia’s standards and guidelines do not allow people closely connected to brands to create articles on those brands. However, Wikipedia has an article wizard which will allow you to create an article, and will then be reviewed by editors for compliance with community standards. If your article is found to meet those standards, it will be approved for Wikipedia by an independent editor. Creating an article requires a significant amount of knowledge. One must understand the basic markup code required to produce a “wikified” article, the rules surrounding sources and their citations, and how to write with a “neutral point of view” (NPOV). Writing with an NPOV tends to be the hardest part for marketers and public relations professionals, who see articles they create deleted time and time again because too much promotional language was used in their creation. If you don’t have the time or ability to successfully write an article that will pass an independent Wikipedia editor’s review, there are other options. Wikipedia has a list called Requested Articles where you can request a specific article be written about your brand. Some of the article requests listed here can wait indefinitely, however. This is not a good option if you’re on any sort of a deadline. I only mention it because it does technically exist as an option. If you’d like your article written in a reasonable period of time, and you don’t want to write it yourself and submit it for review, you have a couple options for hiring the work out. While there are plenty of people and companies that write Wikipedia articles on behalf of clients, most of them violate Wikipedia’s rules and guidelines to do so. Don’t work with them. Many are fly-by-night outfits that create fake accounts on Wikipedia in order to publish their clients’ articles. Don’t be associated with that. There are a small number of services that follow Wikipedia’s guidelines and create high-quality articles. Two that come to mind are Tony Ahn & Co. (the public relations agency that I run) and EthicalWiki. If the required number of reliable sources exist, either company can create a high-quality, professional article for your brand. Both companies stand behind their work. For example, Tony Ahn & Co. offers a money-back guarantee against deletion and has never yet needed to issue a refund. If you are on a real tight budget, you might want to try your luck at Wikipedia’s Reward Board. The Reward Board is a place where people can put up monetary “rewards” regarding Wikipedia articles. You could offer an amount of money of your choosing to have your article written. Various Wikipedia editors frequent the Reward Board, and one of them may take you up on your offer. You pay when the work is completed. While this option may be more budget friendly, you’re dealing with a person. They might not finish the assignment, they might not do it as quickly or as well as you like, or they may produce an article that doesn’t meet community standards and gets deleted. In the end, if you’re not on a tight deadline you might be willing to accept the vicissitudes of dealing with a random volunteer, in order to save on cost. Bonus: Get on the Main Page! If you’ve ever wondered how various articles make it to Wikipedia’s main page, there are specific nomination processes for each section: Featured article, featured picture, In the News, On this Day, and Did You Know?. The Did You Know? section is dedicated to factoids about Wikipedia’s newest articles. If you’ve just had a brand page written, you can get it on the main page by nominating it for the Did You Know? section. Nominations must be for articles less than five days old. Almost all articles that meet the nomination criteria end up making it to the main page. One of my clients got over 17,000 views in just six hours while she was on the main page in the Did You Know? section. What’s your experience with Wikipedia articles? Have you created one on your own? Would love to hear about your successes. Tony Ahn is Chief Digital Architect at Tony Ahn & Co., a hybrid marketing agency in Manila, Philippines that practices both traditional PR and digital marketing. Clients include Fortune 500 companies and major local corporations.